After a couple of days in a desert encampment, we packed up the 4x4s and headed for the town of Tinghir. 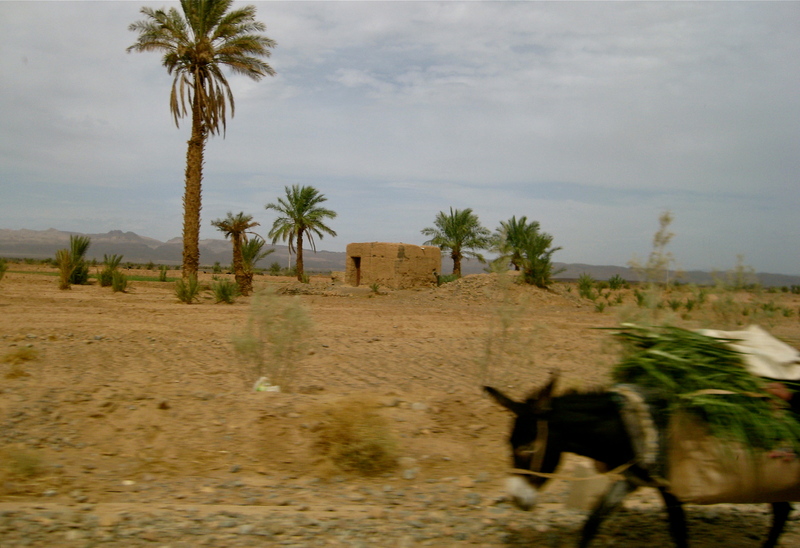 The dusty, bone-jarring track out of the Sahara took us past a couple of nondescript villages, each with no more than half a dozen dwellings, a date palm or two, and an overloaded mule. When we came to a third such village, we barely gave it a glance; but as we were passing by, waving to some children who’d run out to gawk at us, the drivers pulled over. Our guide indicated that this was a stop, and so we tumbled out to look around. What we saw was about a half acre of hard sand dotted with thousands of stones that appeared randomly strewn. 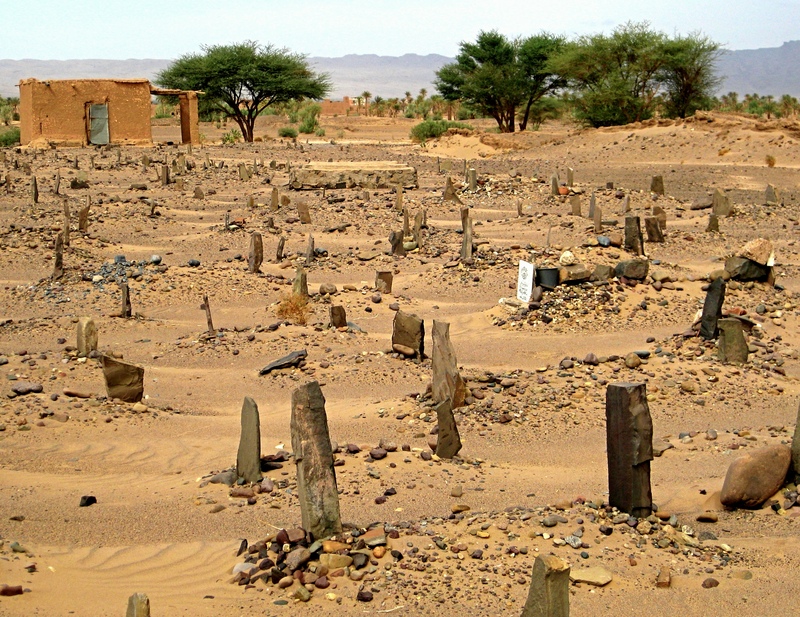 We’d come upon a cemetery; the stones that seemed haphazard were markers on burial sites. Perpendicular stones signified males, horizontal stones, females. You could tell adults from children by the length of the mounds of hard sand heaped over the grave. There were little bowls of pebbles on many of the graves. 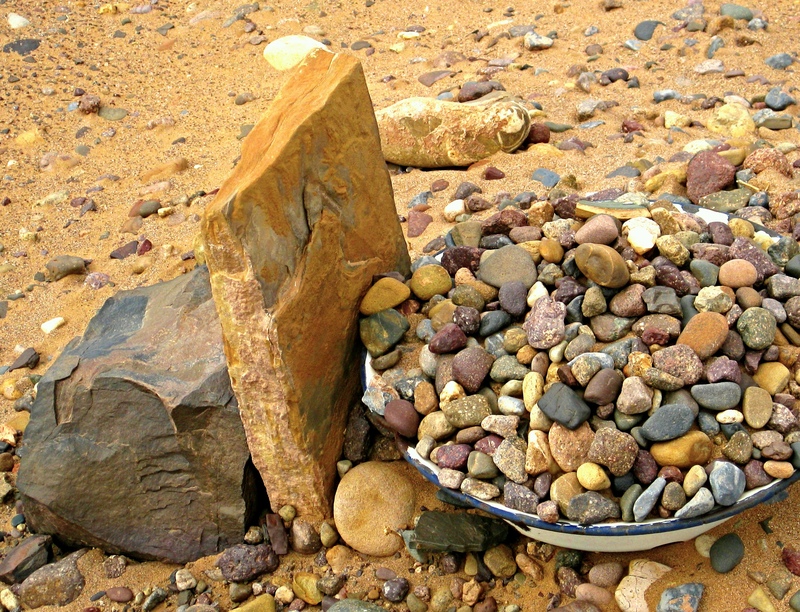 We speculated grandly about their meaning until our guide came up, shrugged, and explained that the pebbles were just to keep the bowls—receptacles for flowers and other memorial gifts—from blowing away in sandstorms. Only three among all the graves bore th e name of the person whose remains lay under the mounds. The rest were unmarked, similar in every respect. Identification of the dead, our guide reminded us, is forbidden among traditional believers for whom the democracy of death is a truth that needs teaching as often and by as many methods as possible—especially in places like this, where life’s cruel inequalities are crushingly apparent, and death is the only thing you can’t buy off with money. The insistent anonymity of these graves rattled several people in our group. The prospect of being stripped of singularity after spending a lifetime trying so hard to achieve it was befuddling. Besides, most of us were bearing up fairly well in the face of life’s inequalities and felt no need to pull back the curtain on the fiction of our distinctiveness. It was all too candid and bleak. Several people were not sorry when the guide moved us along. He pointed to a low adobe structure at the edge of the cemetery. Another shrine to another local saint. “Let’s go see it,” he said. We’d seen many shrines by this time, which explained the soft groans and slumped shoulders that greeted his suggestion. Like all tour groups everywhere, however, we trudged dutifully behind him. 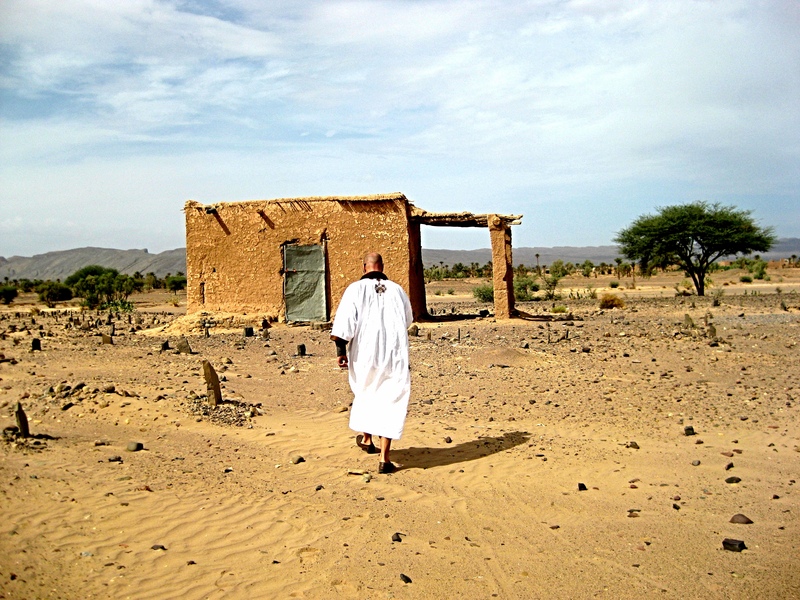 The saint was buried inside the unadorned hut. Worse than unadorned, it seemed neglected, dark and close and (of course) full of cats. There was no light inside except for the brightness at the open door, which we had tugged halfway off its hinges when we came in. This seemed an unlikely place for veneration. One of us wondered aloud, “Does anyone even come here anymore?” As if on cue, three teenage boys materialized in the doorway. By this time, our eyes had grown accu stomed to the dark. We could now see the walls. They were patched and sooty and covered with graffiti. 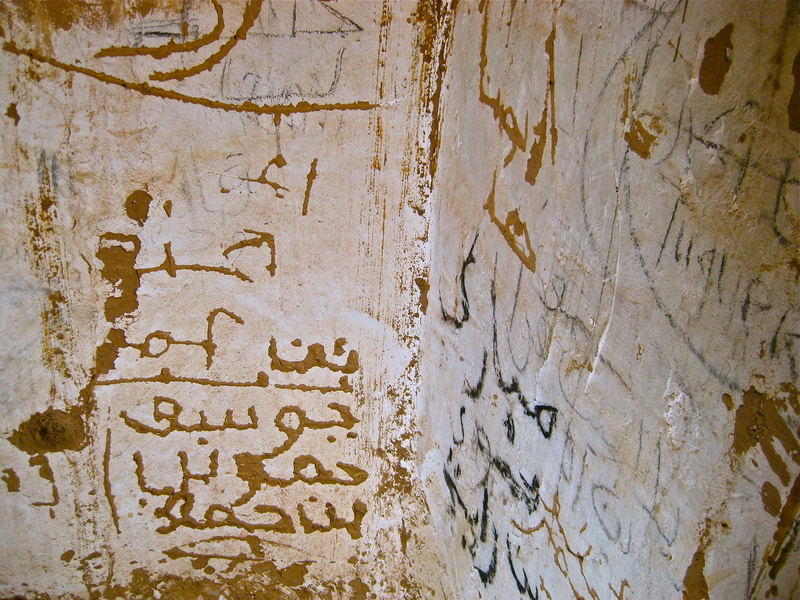 The guide said these were requests for help, reports of success, thanks for favors, but among the more devout scrawls we were sure there were also a few that told the world “Mustafa was here” and “Ali loves Faiza.” The more the guide denied it, the more convinced we became. 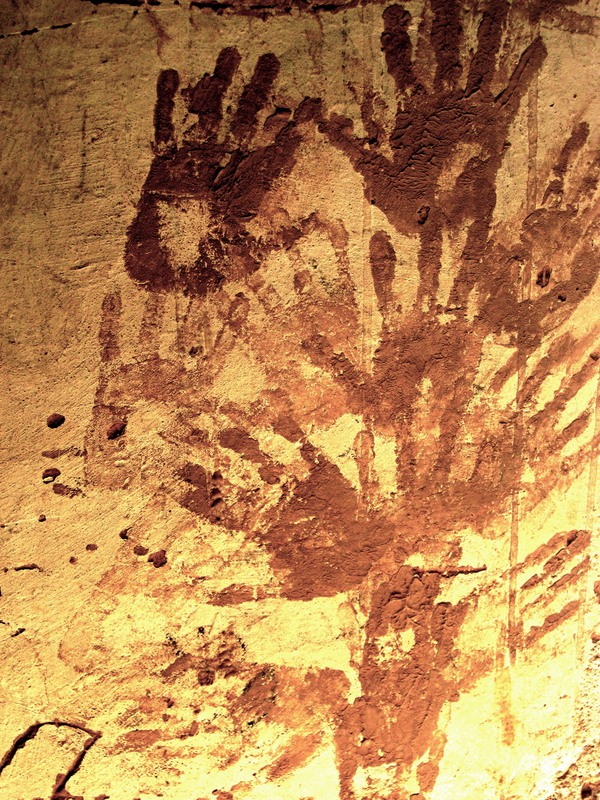 And then we saw the hands, dozens and dozens of small palm prints in bright henna stamped on the walls like Paleolithic cave drawings. These were women’s hands, supplicating, declaring presence and need, tattoos of trouble, imprints of hope. 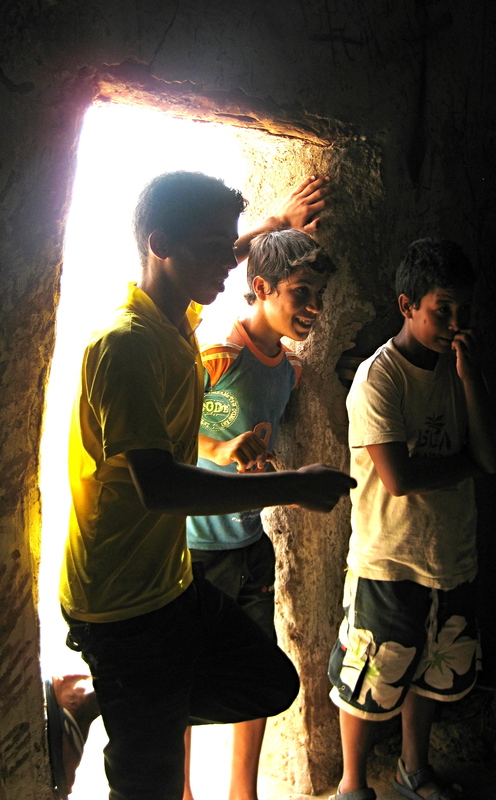 The boys didn’t know how long they had been there, whether they were fresh or ancient, but said they did not remember a time without them. Yes, I thought, that’s because there never has been a time without them. Here in this shrine or anywhere else. And just like the graves outside, and like the human need they conveyed, the small red hands were anonymous, almost interchangeable, absolutely democratic in desire. This entry was posted in Marginal Notes on October 23, 2012 by sicutlocutusest.